"Marie" redirects here. For the Animal Crossing character named Marie in French, see Isabelle. "Inkling" redirects here. For the Smash fighter, see Inkling. Official artwork of Callie and Marie from Splatoon. 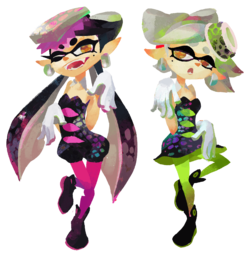 Callie (アオリ, Aori) and Marie (ホタル, Hotaru) are supporting characters in the Splatoon franchise. Together, they make up the Squid Sisters (シオカラーズ, Sea o' Colors) pop duo. They are Inklings, but Marie unlike most inklings has shorter, tied-up tentacles. The Squid Sisters, announcing a stage change in Splatoon. In the original Splatoon, Callie and Marie are a pair of pop idols who host Inkopolis News, where they announce what stages are available for online multiplayer as well as giving information on updates and Splatfests. During Splatfests, Callie and Marie can be seen in Inkopolis Plaza performing atop trucks, much like their Assist Trophy function, although each Squid Sister has their own truck rather than performing on the same stage. These concerts can also be viewed through use of amiibo. In Splatoon 2, Callie and Marie's role from the first game is taken by Pearl and Marina of Off the Hook. Marie now hosts the story mode in Octo Canyon, while Callie, kidnapped and brainwashed by DJ Octavio, serves as part of the final boss. However, partway through the boss fight, Marie is able to free Callie from DJ Octavio's mind control. For the final phase of the fight, they perform together on a stage similar to the one seen in Super Smash Bros.. As of the 3.0 update of Splatoon 2, players are able to speak with Callie and Marie in Octo Canyon after completing the final battle, learning statistics about their performance in online multiplayer as well as various tidbits about the characters themselves. The Squid Sisters performing a live concert for Villager and King Dedede. The Squid Sisters appear collectively as an Assist Trophy character in Ultimate. When they are summoned, they appear in the middle of the stage (teleporting if not there already), and perform a live concert. As they are performing, the camera zooms in on them, and the blast lines get smaller and smaller, making it easier for players to be KO'd. Once the song finishes, the duo disappears, and the camera returns to normal. During the performance, the Squid Sisters will perform one of two songs: Calamari Inkantation or Ink Me Up. Each is accompanied by a unique dance. Squid Sisters won't appear in stages that render characters in 2D (such as Flat Zone X and Pac-Land). stages with a constant layout change (such as Port Town Aero Dive), and stages with stage hazards that can engulf the majority of platforms (such as Norfair). They will not appear if a fighter is in Final Smash standby, and if a Final Smash is activated during the concert (such as by the Final Smash Meter filling), the sisters will instantly vanish. The Squid Sisters also appear together as a Spirit. The Squid Sisters appear as a spirit in Ultimate. In their spirit battle you battle against 4 Inklings on Moray Towers. During the battle hostile Squid Sisters will spawn and you will be easy to launch. The song Ink Me Up plays during the fight. The Squid Sisters as an Assist Trophy in Super Smash Bros. Ultimate. The Squid Sisters in Super Smash Bros. Ultimate. A close-up of the Squid Sisters on Temple. Another close-up of the Squid Sisters on Prism Tower. The Squid Sisters performing for three Kirbys on New Pork City. Ike taunting in front of Squid Sisters on Town and City. The Squid Sisters were the only Assist Trophy unaffected by Isabelle's Fishing Rod glitch. If attempted, only one would spawn, and Isabelle would keep opening the Assist Trophy, but nothing would come out. This is likely due to their mechanic of zooming in the stage, and the game either putting a limit as to how far it can be zoomed in (similar to the one seen when taking a picture) or inadvertently not wanting to zoom in so far as to have it glitch and crash. However, the Devil, whose mechanic also involves moving the camera, was able to be summoned multiple times; that said, moving the camera to a different position is different from zooming in on an object. Strangely, the Squid Sisters' placement in the Assist Trophy category in Training Mode comes after the Assist Trophies from 1st-party universes without playable characters, but before the Assist Trophies from third-party universes, despite Splatoon itself featuring a playable character in the Inklings and being a Nintendo-created and owned property. This page was last edited on April 16, 2019, at 16:28.